Poster, which highlights the plight of big cats, will eventually disappear as pedestrians walk across it. The feline in question, named Archie, is not your average neighbourhood pussycat but a majestic lion. The poster is equally majestic, occupying 260 square feet of ground space. The artwork was commissioned by National Geographic’s Big Cats Initiative to highlight the worrying demise of these animals – a campaign idea that was conceived and executed by PR agency Tin Man. The idea builds on research that shows lions have disappeared from 90% of their historic range and nearly half of the remaining range sits outside protected areas, making it vulnerable to poachers. "Lions play a central role in British culture – they are the UK’s national animal and appear on everything from our national football team’s shirts to the door knocker of 10 Downing Street. Yet, the reality is that lions are dying out at an alarming rate," Dr Amy Dickman, a National Geographic explorer and senior research fellow in field conservation at the University of Oxford, said. 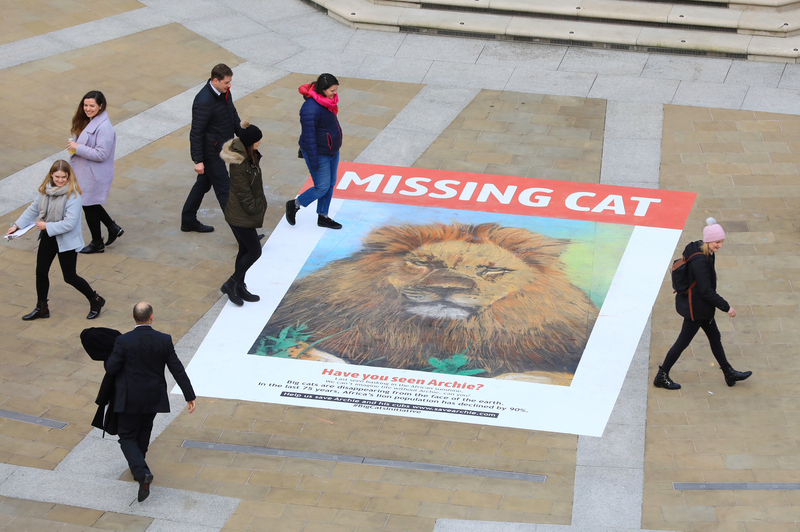 The missing cat poster will slowly and unwittingly rub away as pedestrians walk across it, symbolising how lions are being wiped out and the need to take action before it is too late. It was created by street artist Dean Zeus Colman and required 100 pieces of chalk, eight cans of spray chalk and more than two litres of paint. It took Colman more than 12 hours to complete. A nationwide poster campaign is being replicated in Bristol, Leeds, Manchester and Edinburgh. "Using the familiar format of a 'missing cat' poster but giving it a little twist and replacing a traditional moggy with Archie, our majestic lion, we knew we would create impact. 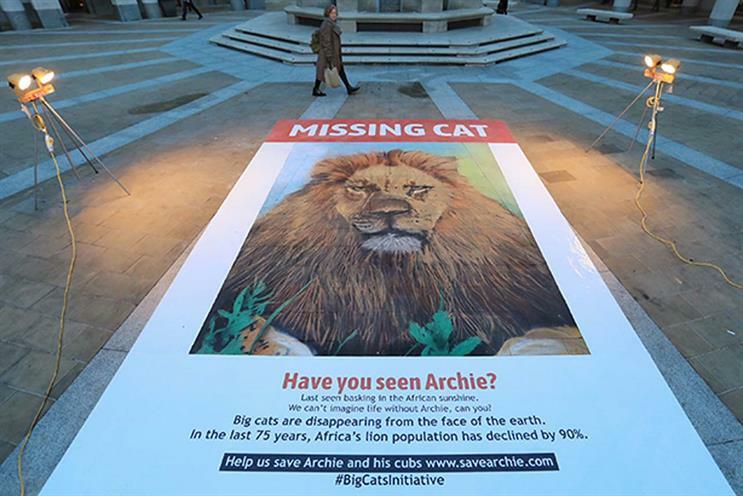 It was important this was more than just a stunt, so we’ve taken it nationwide, with replica 'missing cat' posters highlighting the plight of Africa’s big cat population hitting cities across the UK from today." The National Geographic Society founded the Big Cats Initiative in 2009 with film-makers, conservationists and National Geographic explorers-at-large Dereck and Beverly Joubert. BCI is a long-term effort to halt the decline of big cats in the wild. The BCI has funded more than 120 conservation projects across 28 countries.